1. Put the frozen smoothie mix in a blender with the coconut drink and whizz until smooth, adding a little more of the coconut drink if your blender is struggling. 2. Add 2 tbsp muesli, 1 tbsp chia seeds and the honey. 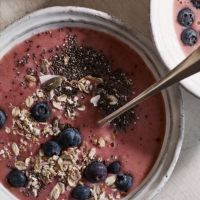 Blend again and, once smooth, spoon into 4 breakfast bowls. 3. Top with the blueberries and the remaining muesli and chia seeds. Serve immediately, with an extra drizzle of honey, if liked. This recipe was first published in Thu Apr 26 15:45:21 BST 2018.